Every song arrives at its own pace. Some flow in, running almost. I have to fight to keep all the words in memory until I can find paper. I've lost more than a few songs because I didn't make it in time. Quick songs make me feel powerful, like I can conquer anything. But others are slower, more difficult, and much more humbling. When a song gets particularly hard for me, I stretch myself out on the floor. To an outsider, it's easy to mistake this for napping. My eyes closed, my hands behind my head in classic napper's pose. I may stay like this for long periods of time, possibly hours. But this is a deep meditation, and far from relaxing. I don't know if it is a good practice, but I have solved a lot of my most puzzling, frustrating moments this way. When I do finally get the answer I was looking for, I feel exhausted...how is that possible? Not to be too self-pitying, I know there are harder jobs out there than writing, namely all of them. And I have respect for everyone of them, but this is honestly how it goes. She's Got A On Me was so tough to figure out that it took me a second to realize how special it is. Maybe because we felt it was a special song that we were so focused on getting it right. The hook is fun to sing, the groove is heavy. The whole song is a delicious fuzzy bass-solo which makes it amazingly fun to play. Dan used a sans-amp to get the sound. I had never seen that before, but it sounded tremendous. The man has many tricks up his sleeves. The video was great too, a special thanks to everyone who made that shoot so much fun. For the better part of the week, I found myself on the floor of my apartment, humming the melody. Repeating the lines. Playing the chords over and over in my head. Turning phrases, re-arranging them. Throwing away verses and choruses, and starting over. Like I was in a coma. The quiet. The isolation, because it doesn't matter what happens around me I am only in my head. Focusing to the dark of my eyelids like the ocean surface at night, waiting for a sign to surface. It isn't like traditional writer's block I've known, I've had that too,-- Which is best remedied by going out and participating in the world. Living fuels creativity-- because the words are there. Just not the right ones. I don't know what it is about a particular phrase that jumps out at me to say I've got it! Sometimes I'm lost among words. Never sure what I'm looking for. I am uneasy until things feel good. Like the puzzle is unfinished. There is more to discover. And diction is the key. I don't know if I've had a song as tough as this one since. I'm not really looking forward to it happening again. Here's hoping it won't... Maybe I have gotten better, maybe I need to be more critical... But I still work out tough spots with my laying meditation. Watching the emptiness for the right words to come along. I have a need to kick. of stones and empty cans. to make him claw it? to make her bark when I pass? I have started cleaning a pool recently, skimming the surface from leaves, little clusters of Oak pollen, and a variety of bugs that find themselves surface trapped... I can never tell if they want to be there or not but I remove them anyway. I have found a lot of metaphors can be drawn from this. The task gives me a lot of time to think about nothing. One that comes to mind with Younger Days is the persistence of trying to perfect the imperfect, this is sometimes called art. Constantly, vigilantly, removing mistakes however impossible it is for any thing to be completely perfected, or if you managed to get the pool clean, it only lasts until the next breeze shakes the trees again. And one, of numerous, imperfections that appear in all creative writing is the cliche. We all know to avoid cliches, but sometimes it is hard to tell what is cliche, what is derivative, and what is re-imagined. It is no secret artists use other works as inspiration, sometimes drawing directly from those sources. In literature this is called Allusion when done well, and Plagiarism/Stealing when not, the difference occurs when the source and the new material created appears as new and exciting. If the artists takes from general convention and uses common source material, we can further degrade it by calling the work cliche. Though it is interesting that what was once new and inspired can become cliche through cultural overuse. Even to the point that the distinction becomes less about the work itself and more about what seems trendy. Some of the biggest cliches we have are overused because they are so understandable. They say exactly what we mean and the metaphor works well so it is repeated naturally. Granted they aren't very creative to use, but they can be effective. There are too many examples in pop music to even begin to cite. In my younger days, I wish I knew then what I know now. But that whole subject is cliche. There are so many songs that use every part of that phrase so I didn't want to simply write another song about that. I am also certain Willie Dixon, or whomever wrote the line, got the idea from somewhere else. It is a common enough phrase. Plus I am not that old so there is no need for me to worry about the past so much. What I liked was the idea of writing from now. These are my younger days. I hadn't written the song with that beat, Jaime had evolved it through playing as a group. It is a really fun song to groove to. A machine of rhythm. Every part dances with each other. It might be hard to hear but the piano is the heart of the beat. I like the progression deviating from I/IV/V at the end of each phrase. I don't think Dixon did it like that. And the bass tone is awesome thumpy on record. Sounds like a razor live. One of the songs that really pushed my experimenting with bass fuzz. So back to the pool and writing. It's not so important to have the pool perfectly clean, or my writing impeccable, but only clean enough to enjoy a swim without dirt interfering with the experience. No one wants to swim in a cluttered unkempt pool, but a leaf or two won't stop anyone either. At some point I need to put down the skimmer and jump in, let things happen. There is always something to pick apart. Always a phrase to revise. It's hard to listen back and not think, if I had only changed this...I would love to clean up that bit. I'd rather enjoy the result, imperfections and all. Maybe someone out there has perfect diction, perfect phrasing, and never has to worry, but I haven't seen it yet. Everyone has mistakes, cliches, and other solecisms fluttering in, either on the surface or hidden underneath, making it easier to be less self-conscious about my own writing. than I can keep with. giving ground in tangles of auburn roots. Imagine a moment when reality becomes so clear everything clouded and murky is wholly removed leaving only a feeling of completeness. In a beautifully violent moment, like seeing the black expanses of space after the world rips away from underneath. So unreal it might only seem like a dream, but my wait for this experience is the root of Doomsday. Doomsday isn't a song about the literal end of the world, but the end of a thought. A spiritual moment when I lost an idea of myself. It is not a negative moment, though the song plays dark, but it is a jarring one. The unexpectedness of a realization can be frightening and tinted with sadness but it is also soothing. The change itself is beautiful. Everyone has lost, and will continue to lose, but that doesn't make an interesting story. But what if I'd needed the loss? Waited for it. Anticipating. That was more unexpected to me. That was the part of the story that drew me. Wanting change. Loving it, because when life is altered so drastically, more of our self emerges. And that revelation can be devastating and blissful. Every moment that has brought what initially felt like an ending into my life: graduations, birthdays, relationships, deaths, has been an opportunity to learn change. Doomsday wasn't originally as modern or synth-y as it came out, but I love the vibe. Dan really pushed the direction and he was right. The soundscape is beautiful. The song structure is folk-blues, with a warped solo for a bridge. Recently we have reworked the song for a three-piece and I have gotten to take over the solo duties, which is a lot of fun. The solo is brutal and destructive: mountains falling, volcanoes erupting and all the bombast. The falling chord progression underneath really carries emotion. The beat and the main riff are almost studio one-style, it is a bit of a mind trip to play and sing, but really fun once I start feeling and stop thinking about it. How do you know when it's done? When is anything over? Events rarely erupt in one catalyzing moment that defines the future. Life moves slower. Dies slower. And also continues on, echoing on into the future. Giving another frame after the one before. The moment a relationship ends is usually not when we try to name or define it, but long before. In some unassuming look, or a careless word. A seed of doubt. A drop of poison. Growing. Quietly building strength, 'til the moment there is more doubt than trust. That tipping point, the closest thing we can call an end, is always unknown, but is the moment I was looking for. I don't think it is ever discoverable. The When... Now I'm sure that when is unimportant. Change is inevitable. I have to accept impermanence rather than resist it. It comes to my door like a stranger, on a day like any other. I don't need to worry about when or how, that is exhausting. The value in anticipating change comes from having an open heart. Not trying to shut it out, but welcoming it in. The character is ready, maybe a bit obsessively, but completely open. As one moment ends, another comes in to take its place. And so moves on, being moved. Do you know how many times we've cut out this weed? Wrapping a hard fist over root...how many times it came back again? You might think I knew what I wanted out of life early on. That there was a five-year-old me somewhere in San Antonio playing air guitar and jumping off the bed, stage diving in pajamas, always knowing that I was meant for performance. But that's not the case, well not entirely. I found my calling in high school while taking a correspondence course in American Lit. I fell in love with the Short Story, and pretty much all written word. Fitzgerald first, followed by Hemingway, Twain too, I jumped a bunch from then and just started reading everything I could. I was captivated, obsessed. I needed to write. A few great teachers led me on. Introducing me to the Beats, Hunter S. Thompson, Vonnegut. It was all I thought about. I knew I was going to be a writer and fantasized all the cliches: University! Better: Ivy League. no run away...a vagrant poet... go to Europe, ride the trains, or ride the American trains, build a lake front cabin, be a prophet of Time Square... I wanted to do it all. Often dreaming in classes that had lost my interest. 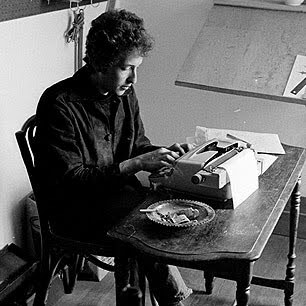 For me there was only the word: write. There was only one problem. The writing didn't come, or at least not the way I hoped it would. I tried short stories, which were my favorites, but I had no idea where to begin. It seems easy enough: tell a story. It is much harder once you get the pen in your hand. Staring at a blank page of infinite possibilities. Stories can go anywhere, but the longer the page lay blank, the more I felt the possibilities narrowing. The more I felt I was going nowhere. The short story gave me and my dreams a beating just shy of dead. the tillers start to turn. I needed to start smaller. By then I had been to a couple creative writing classes, read some books, made some bad attempts at a lot of writing, and found that my best bits came in short phrases. Not whole stories, not whole chapters, or pages. Not even paragraphs or sentences. But fragments. Little groups of words that moved right. That sung. Flashes of ideas that sparked success. I started to collect them. Re-arrange them. Re-work them. It was tough, but I eventually made them look like poems. Not great poems. Nothing I felt I should start submitting, I wasn't that naive. The really good thing about them was, they looked and sounded like poems. Which was good enough for a start. As goofy as it sounds Bookmovie is the modern American form. That is why I feel the books that attract the widest audience, get made into movies so consistently. The story in exact pictures. So I was really excited when a full story came to me. Even if a simple one. A sailor, a boater, drifting in a small vessel at night. Falling asleep, letting the currents take him. A living ocean, pulling him into the unknown, like a ghostly calling to the water, to death. I saw every frame of it. From beginning to end and tried to put what I saw to music. Earlier I wrote how Loud Is The Night was composed of vignettes, little stories, an album of fiction. This one was a visual story I'd been wanting to tell for a while. It might have started as a dream, a daydream probably while I wasn't paying attention in school. Falling into the water, an abyss, giving away control like I had nothing to lose. School gave me that feeling sometimes. My favorite part of Where The Waters Roam comes at the breakdown. When the words actually fall away. The drum beat rumbles a steady wave with the bass. The organ swells like desire and the guitar slides an ethereal melody like a distant siren. I love that the music sounds like the dream felt. The other great part of that song is the chorus was unexpectedly enhanced by two members of Dr. Dog. They helped us so generously with a lot of the vocals on Loud Is The Night. I want to say thanks again to Frank and Scott for being so kind. It took me some time to get the story to fit the melody. The chords and melody of the song were written by Abe and Jaime. I had to write the story into it. I don't know if the song came off as lyrically strong as I had hoped it would... the music and melodies are still amazing...but I am proud of it. Some kind of hybrid between The Supremes and Pound, I tried to write with his grumbling deep voice reading the words in my head. It is something I'm always trying to improve on. Making Songmovies. Where The Waters Roam has a unique feel. Other songs were snapshots of stories. Chapters. This one felt like a beginning and an end. A complete idea. Songwriting has become my medium. I still write a lot of poetry, and have recently begun a new attempt at short stories, also a blog, but songs are where I feel I found myself. Part of the purpose of this blog was for me to work through where I have come from as a writer, to look back and see how much has changed for me. How much I have changed. But now I also see that it is about defining myself. And where I will go. Into the dark. Where the waters roam. I wasn't even aware it was stuck, slowly closed in on her face. Like a train rolling in she wore no surprise just soft anticipation. Even softer than missed popcorn in the falling dark. How many times will she live this? How many times will she wait? Longer than celluloid, a digital eternity. It is heaven. It is hell. Waiting for a kiss.